"Nature's Jewel, close to the Pulsating City Life"
Read or write your own review on Tripadvisor. Click on the image above for reviews. 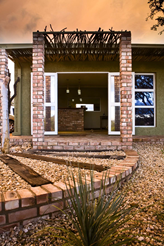 At Windhoek Game Camp we offer our guests luxury self-catering accommodation in the middle of nature. The camp is situated at Brakwater, about 20 minutes drive from the CBD of the City of Windhoek. This game farm in the city have free roaming giraffe, oryx, springbuck, waterbuck, impala, nyala, warthog etc. etc. 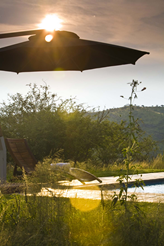 Windhoek Game Camp is a family owned luxury, self-catering, "tented" lodge, in the middle of nature, surrounded by birds and game, yet very close to the pulse of Windhoek - for those who would like to have the best of both worlds. 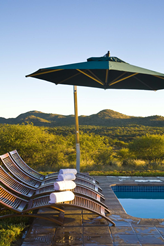 Windhoek Game Camp is popular, not only for the international travellers and holiday makers, but also for corporate business visitors, preferring the relaxed farm atmosphere. 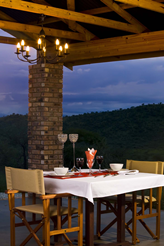 This is also a favourite breakaway for Namibians during the week or over weekends. Windhoek Game Camp, nicknamed the "Game Farm" is a stone's throw away from Windhoek, the capital of Namibia and in the centre of Namibia. It is the address to start and end your journey to and from Etosha National Park, Sossusvlei, Swakopmund or any other destination in Namibia. Windhoek is a malaria free area and Namibia an Ebola free country. Windhoek Game Camp does not cater for camping or day visitors. Copyright � 2015. All Rights Reserved. Designed by Ministry of Magic.